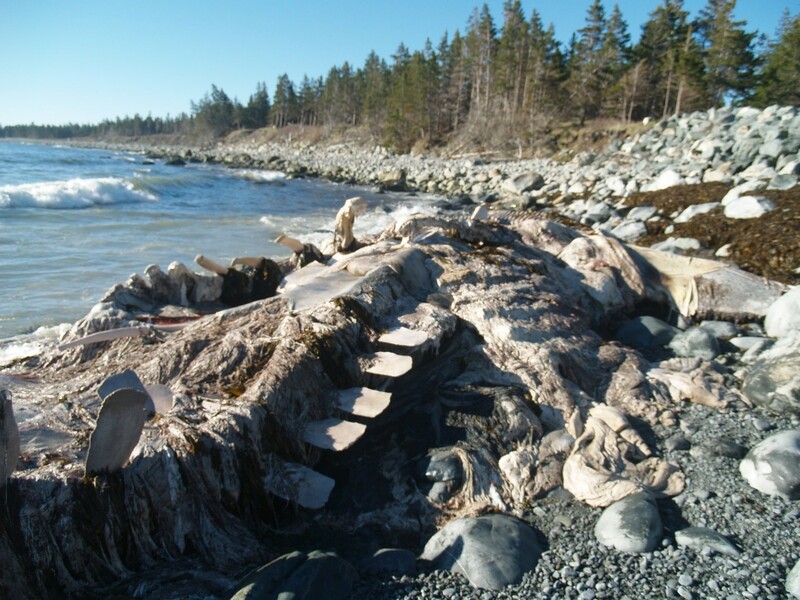 Researchers from the New Brunswick Museum and other organizations conduct a whale necropsy near Liverpool, Nova Scotia. Sometimes research can get a little messy. At least when you are conducting an animal autopsy, called a necropsy, on the largest mammal on the planet. That’s what Mary Sollows, the New Brunswick Museum’s Curatorial Technician in Zoology, and Madelaine Empey, a Student Zoology Assistant, discovered when they joined a team of researchers from the Marine Animal Rescue Society, Dalhousie University, the Atlantic Veterinary College and the Department of Fisheries and Oceans to study a young female blue whale found floating dead in the ocean near Liverpool, Nova Scotia. The blue whale, which measures up to 34 metres long and can weigh up to 150 tons, is an endangered species. There are only about 600 to 1500 blue whales left in the North Atlantic. Threatened by pollution, climate change, declining food supply and collisions with boats, the deck is stacked against the blue whale’s survival. That’s why it was so important for researchers to examine the blue whale’s body to find out why it died and to collect samples, including those destined for the New Brunswick Museum’s marine mammal research collection, one of the largest in Canada. 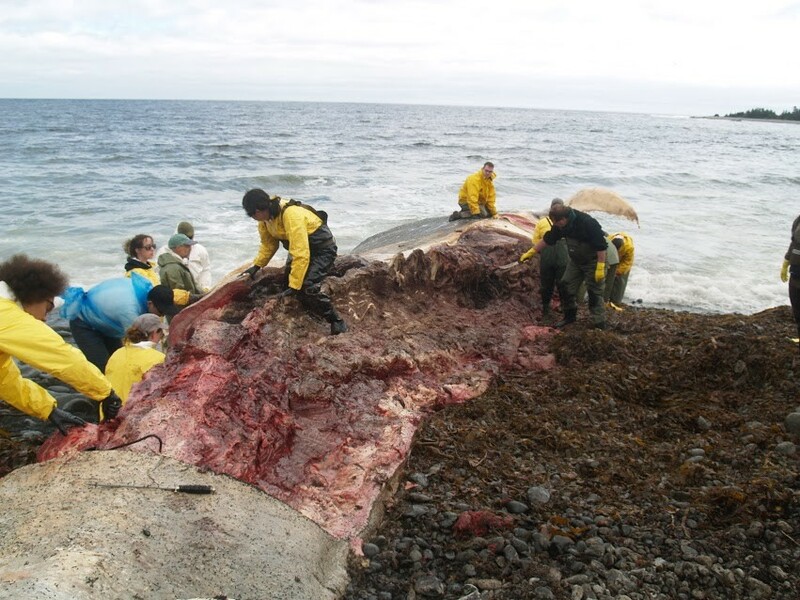 The Blue Whale carcass on the second day of the necropsy. The blue whale’s body was pulled to shore where the necropsy began. If your image of an autopsy comes from an episode of the television show CSI, well, this was nothing like that. Day 3 of blue whale necropsy…getting close to being finished and still going strong! A large blood clot was found among the thoracic vertebrae, a possible clue as to the cause of death. One theory was that the whale became trapped under ice and drowned. However, it may takes months before a conclusion can be reached, and given the advanced state of decomposition, a definitive answer may never be known. Deep in the thick of it, literally, was the New Brunswick Museum’s Mary Sollows. She was joined by her (apparently extremely supportive) husband Ken Sollows. The pair focused on recovering the baleen plates that hang in the mouth of all non-toothed whales. Baleen is made of keratin (the same material that makes up human hair and nails), and blue whales have hundreds of plates that hang from the upper jaw providing a sieve-like function that strains food from the water. Meanwhile Madelaine helped remove the tough, fibrous, tissue that surrounds the bones of the vertebral column that extends into the tail. She then worked with others to separate the various elements of the backbone. 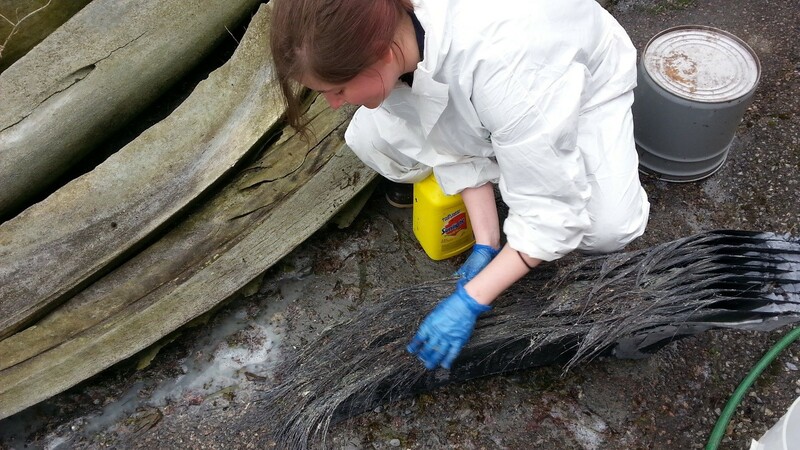 The New Brunswick Museum’s Madelaine Empey collecting baleen samples. It was tough, messy and smelly work, but Mary and Madelaine collected important samples of blubber, muscle, baleen and bone. While the New Brunswick Museum has an extensive collection of whale materials, these are the first New Brunswick Museum samples from a blue whale. 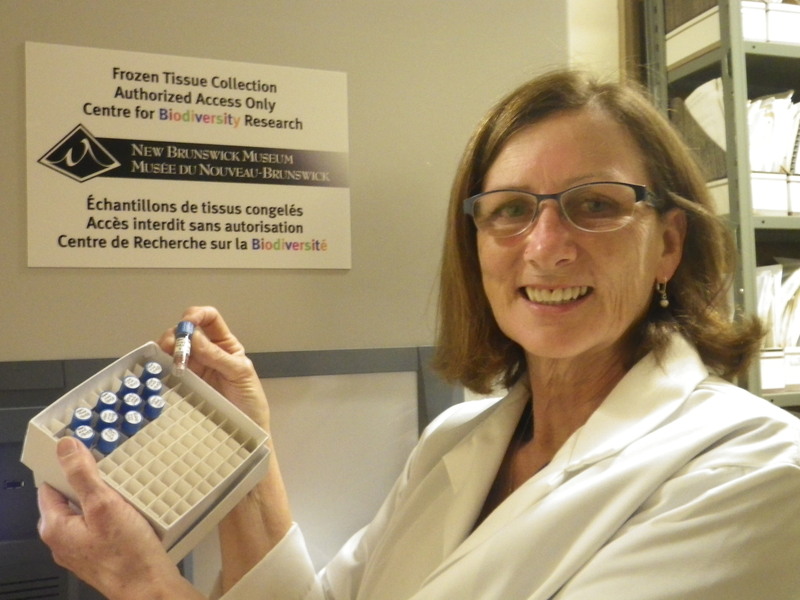 Mary Sollows, with cryovials of frozen Blue Whale tissue, stands by the NB Museum frozen tissue collection. This specialized freezer can house up to 30,000 samples at -80o C.
These kinds of samples are vital for research. For example, baleen samples from other whales have been used to study aging, contaminant loads, feeding ecology, movements and more. Once back home at the New Brunswick Museum Collections and Research Centre, Madelaine and Mary spent a day cleaning and preparing the collected samples for the research collection. While air-drying, the baleen will be monitored for mold and insects and, once dry, will go through a freeze/thaw/refreeze cycle to ensure any insect pests are dead. Blue whale muscle and blubber samples are a rare commodities for researchers, so the samples collected will become part of the Museum’s frozen tissue collection, an archive available for future research. The loss of an endangered young blue whale is heartbreaking but researchers from the New Brunswick Museum and other organizations took the opportunity to learn more about the life of this beautiful creature to help scientists better understand and protect this species. It’s part of the Museum’s ongoing research into our natural environment. With information from Madelaine Empey, Mary Sollows and Dr. Donald McAlpine.